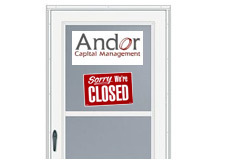 It's the end of an era as Andor Capital Management LLC has announced that it will be closing its doors in October. According to a recent WSJ article titled "Andor Closing as Benton To Move On", the fund has announced that it will be closing in October and returning money to investors. The fund currently controls about $2 billion dollars in total assets. In a letter to investors, co-founder Daniel Benton announced that he was retiring from managing outside capital, which is the reason that the fund will be shutting down. According to the WSJ, the fund has lost money this year, but the exact amount of unknown. Benton cited a desire to spend more time with his family and on "other interests" as the reasons why he is retiring. The fund will not immediately stop investing - managers will continue to invest the company's funds throughout September, and then begin the process of returning funds to investors in October. Daniel Benton split from fellow co-founder Christopher James in 2004. The company calls itself a "long/short equity hedge fund" that focuses on "bottom-up, fundamental research". Benton and Arthur Samberg had an "amicable" split in 2001, which led to the formation of Andor Capital. Benton was originally a personal computer analyst for Goldman Sachs, and then co-founded Pequot Capital Management along with Samberg. The two split, with Samberg maintaining the reins at Pequot and Benton leaving to run Andor Capital. At its conception (2001), Andor Capital had $7.5 billion dollars under management, and was able to pluck a number of high-profile employees away from other hedge funds and brokers. The company first ran into trouble in 2003, according to HedgeWorld News. The publication states that Andor Capital's funds lost anywhere from 15-22%, even in the face of an incredibly strong Nasdaq. It appears as though Benton was decidedly bearish on the tech market at the time, and his funds paid dearly for it. He switched his stance through the year, and by the end of 2003 had an estimated $6.1 billion in long equity positions. I'm not entirely sure how Andor Capital's assets were pared down so dramatically from 2003 until now. In the hedge fund world, it can be nearly impossible to obtain any information. Did the company perform poorly between 2004 and now, leading to an erosion of fund assets? Did Christopher James take some of the investors in the funds with him when he left in 2004? Did investors pull their money from the fund? Was it a combination of all three? Best of luck to Mr. Benton (and all Andor Capital employees) in the future.